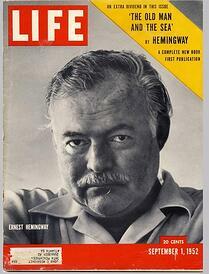 Even people who have mild opinions on Hemingway tend to be drawn to this particular book. It’s a short work, running fewer than 130 pages in paperback. Its plot is simple: it is about an old man who wrestles with a massive marlin, loses his catch to hungry sharks, and returns to the Cuban shore. In these few pages, Hemingway was able to imbue his tale with captivating insight and wisdom. Below, we've compiled some of the lessons that help make The Old Man and the Sea a true classic. 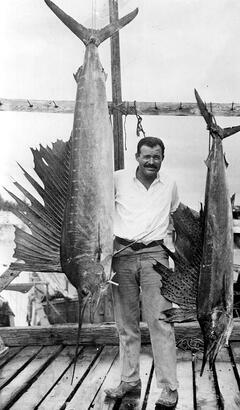 Hemingway begins his story by characterizing the fisherman Santiago through his appearance. Hemingway writes: “brown blotches of the benevolent skin cancer the sun brings from its reflection on the tropic sea were on his cheeks…and his hands had the deep-creased scars from handling heavy fish on the cords.” Santiago’s body is marked by its long battle against the hostilities of nature, but his scars are not ugly. Instead, they are appropriated and made beautiful by the exalted struggle in which they were formed. Animals are much the same. Looking toward the sky, the fisherman begins to feel "sorry for the birds…Why did they make birds so delicate and fine as those sea swallows when the ocean can be so cruel?” To Hemingway, dignity is acquired through strength amid struggle, the ability to trudge on in the face of pain and exhaustion. At the end of the book, the author encapsulates this spirit with this famous line: “Man is not made for defeat. He can be destroyed but not defeated." Santiago does not hate his adversarial marlin, rather, he reveres it. This is the single difference he is able to delineate between fish and the human species: “They are not as intelligent as we who kill them; although they are more noble and more able.” He feels respect for the fish in his fight. The marlin has its powerful virtues, and he has his. Santiago understands that out in the wilds of nature, all life is equal. The sea does not pick favorites. The noble fisherman refuses to designate himself as a righteous overlord over the animals, instead recognizing his grand fraternity with all around him. Santiago figures that it is unjust to have killed the fish in all his “greatness and his glory.” For who is he to kill this gorgeous, dignified creature? He considers that it may have been a sin to kill the fish, although he did so to feed himself and others. Santiago resolves to set this sense of cosmic culpability aside, deciding to let more qualified people think about matters of sin. He reconciles his actions by saying to himself, “You were born to be a fisherman as the fish was born to be a fish." When Santiago ties the dead marlin to his skiff, he realizes it is massive, considerably larger than the boat itself. While he has won in his fight against the fish, his work is far from over. He must get back to harbor, and he is engaged in a grueling battle against hungry sharks. He fights them with oar and harpoon, but they overwhelm him, consuming most of his prized catch. Yet he does not rage against his fate; he does not let bitterness or disappointment consume him. Instead, the fisherman hopes he did not worry the village by being away too long, he remembers the people back home, and looks forward to enjoying his “friend,” bed. After Santiago arrives on shore, tourists spot the white spine of the marlin “that was now just garbage waiting to go with the tide.” A Spanish-speaking waiter tries to explain the sight, and manages to say “Eshark.” The curious tourists misunderstand, and instead think that the skeleton belonged to a shark, creatures which are, after all, boneless. This episode, which concludes the novella, suggests that language barrier or not, only Santiago and the sea will ever know the truth.